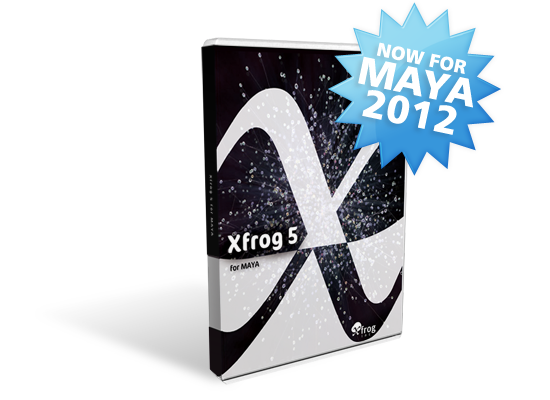 This new update to Xfrog 5 makes it fully compatible with Autodesk MAYA 2012. Download the free 30 day trial, or visit the Xfrog 5 page for more information. Xfrog adds six new procedural Objects to Maya. By combining these with Maya components and objects you can create a wide variety of organic models and animations using organic procedures (based on some of the building blocks of Nature). This entry was posted on Monday, June 27th, 2011 at 3:34 pm	and is filed under Press Releases. You can follow any responses to this entry through the RSS 2.0 feed. You can leave a response, or trackback from your own site.